Without question, the oldest business presently operating here in what we call the "Mountaintop Area" under continuous family ownership is that of the Halls. Within the next decade, we will celebrate 100 years of friendship and service to the greatest people to be found anywhere -- our neighbors in Snow Shoe and in our two townships, Snow Shoe and Burnside! We're "HOMETOWN PROUD" and offer continuing thanks to every ONE of these people... often directed by friends, with the definitive, "You can get it at Halls"! The site of our birthplace still stands in Clarence; interestingly, at the Eastern most end of Rails to Trial’s right of way! Yes, the old New York Central train crews often stopped those giant locomotives right next to us and took time to shop for some badly needed, fresh supplies of milk, tobacco, candy, bread, whatever -- even once to take a fatally injured motorist at that very crossing to the hospital in Lock Haven! The business was started in Clarence, about 1912 or '13 by William B. Hall and his son, Clair (and Ira, a bit later), and operated as W. B. Hall & Sons. At that time, they were managing a coal-mining operation on #10 Hill in Clarence for David Chambers. The business flourished and expanded throughout the years and two more brothers, Fred and George, joined the business in the early to late 1930’s. In 1938, through the influence of Philadelphia friends who hunted deer with them, they started a very new business in the Mountaintop -- the manufacture of women's hosiery under the name of Snow Shoe Knitting Co. The grocery business was always the prime concern and interest of the older brothers. The manufacture of women's and men's clothing began to require more attention, and with the Second World War in the offing, the last brother, Bill, joined his hard-working brothers in 1940. 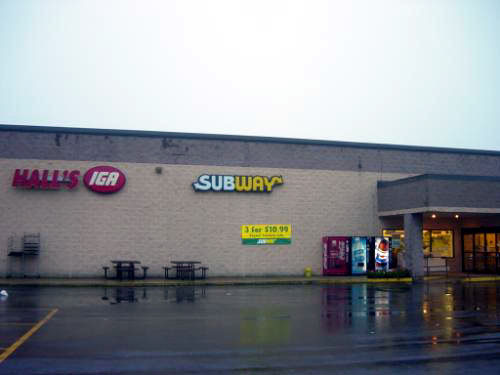 In the early 1970’s, the IGA grocery store was moved from Clarence into Snow Shoe Borough permitting badly needed expansion by doubling the previous space, and the Clarence site was gradually converted into a Convenience Store. It eventually closed because of growing operating losses through reduced business. It is now a rental property. In 1990, because of cramped quarters again, the store in the borough was converted into a True Value Hardware Store and the IGA grocery branch was moved into a brand new 22,000 square-foot supermarket at it's own location near the Snow Shoe exit of I-80. At this present location, Halls' now offer its customers over 25,000 items in the food line alone, as well as countless accessories, all in one location. This well stocked store has also become the favorite shopping place for dozens of nearby camp owners and residents of small close by developments who find it more convenient to shop here than to drive farther into Bellefonte or State College. Also, many travelers on I-80 who have heard of its popularity make regular stops on trips to Penn State's sports events and meetings. 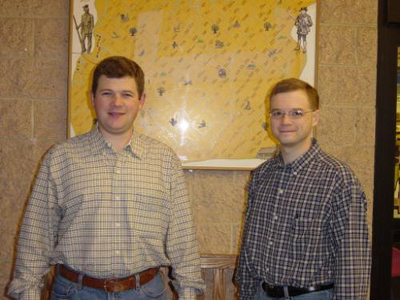 A major change in management took place around the turn of the century with the transfer of full ownership to Dan Hall and his sons, Troy and Jason. All three handle the day-to-day operating affairs of this and the Mountaintop True Value Hardware in downtown Snow Shoe. In this change, Bill, the last of the original five Hall Brothers, left the business but the corporate name still remains Hall Brothers, Inc. This now represents a fourth generation ownership - a point of pride to the Halls. And they look forward to a continuation of super service to their home town - the Mountaintop and surrounding communities.